Ceiling fans are a great way to stay cool during the hottest months of the year, however it seems a shame that when we invest in a fan, it is only for a short period of the year- but it does not have to be this way. Did you know that using your ceiling fan in winter is an effective way to warm your house? If your fan is fairly modern, it should be quite easy to change he direction. Turn the fan off and look for the direction switch, which will most likely be in the fan’s motor housing. Fans generally run counter-clockwise in the warmer months. By changing the direction to clockwise, you are pulling up the chilly winter air and pushing down the warm air that congregates below the ceiling and above the fan. Warm air is created through airflow; however it does not need a strong flow to create warmth. Turn your fan down to the lowest setting possible so that there is a gentle flow of air, but not enough to create a chill. If your house has high ceilings, you may not need to change your fans direction, as previously discussed. The high ceiling and low speed will be enough to pull the warm air down without creating a chill. Instead of wasting energy by having your fan running during the day, it is only necessary to run your fan in winter when someone is in the room. Whilst in summer, a fan keeps the house cool for when you arrive home, as a hot house is easier to cool than a cool house is to warm. It shouldn’t take too long for your fan to warm your room when you get home. 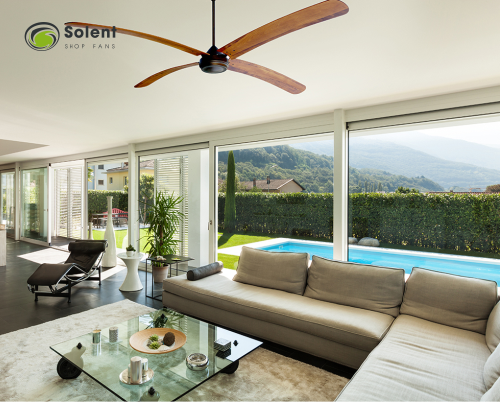 Get Your Stylish, Energy-Efficient Fan from Solent Today! Now that you know fans can be beneficial in the winter, there is no excuse to wait until summer to invest in one! Contact us and let us assist you find a fan that is perfect for your home- or browse through our fans and order today!